At East Sussex based Active Kampers we believe that hiring a new VW California campervan is the perfect way to enhance your holiday, festival or road-trip experience. HIRING TWO VW CALIFORNIA OCEANS. BOOKINGS CAN BE MADE NOW! After 6 years in Brighton we have re-located conveniently to Wilmington, Sussex (famous for the chalk figure The Long Man), on the south coast of England, and only 45 minutes from Gatwick airport. So why not hire a van to explore the beautiful Sussex coast and South Downs, or take your VW Camper hire to the nearby Isle of Wight, New Forest or even down to Cornwall? Active Kampers is an owner managed business, hiring only VW California’s. Set up by campervan, camping and outdoor enthusiast Matt Want to know More? 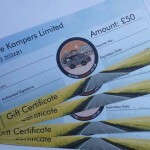 Gift Vouchers Available! Buy an experience, surely better than an unwanted present! Our Diesel powered vans are very economical to drive and can achieve 40mpg, double that of many of the older or larger camper vans. We also offer a low insurance excess. Hire or bring your own kayak / bikes / surf board / skis / snowboard and make the most of our vans! Did you know? Over half our vw camper summer hires journey to Europe? Sustainability Active Kampers strive to be an ethical and sustainable company… find out more Want to buy one of our VW California’s? We sell one or two of our Campervans at around 18 – 30 months old every autumn.